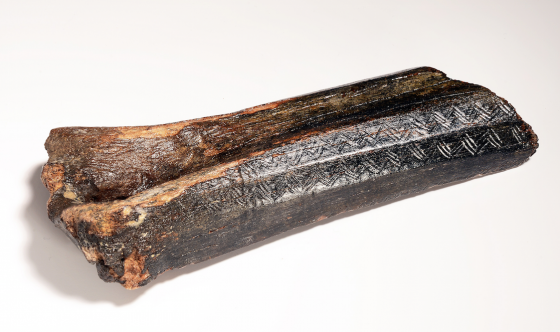 The oldest Dutch work of art is a 13,500 year-old carved bison bone dredged up from the bottom of the North Sea, archaeologists write in an article published in Antiquity magazine earlier this week. Main author of the article and prehistory curator at the Leiden museum Luc Amkreutz thinks these objects were not used as tools but belong in a ritualistic context. ‘I wouldn’t know what else you would do with a decorated horse’s jaw’, he told the paper. What the carvings mean is unclear. Some have interpreted the zigzags as symbols of movement, rhythm, water or a need for symmetry. ‘But we will never really know,’ Amkreutz said. The article also describes a piece of a human skull that was fished up from the North Sea in 2013 and which dates from roughly the same period. The parietal bone, which may have belonged to a woman, is 13,000 years old and one of the earliest examples of Homo Sapiens remains found on Dutch territory. The scientists have also found tiny indentations which may point to anaemia or a lack of vitamins, which would lead to scurvy or rickets. The search is now on for DNA in the skull fragment so more tests can be done.